One of the first few questions I’m often asked by clients is what they should wear to their family session. I know it can feel kind of daunting to pick what to wear for your session, but it doesn’t have to be! 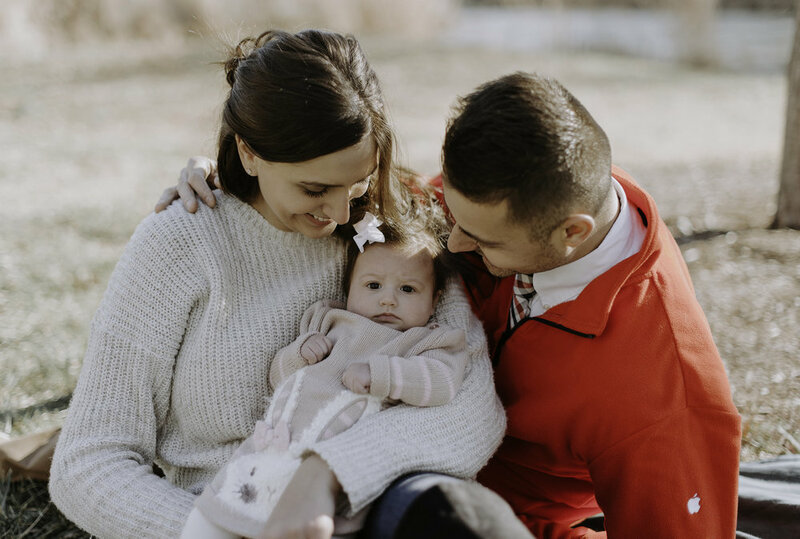 Photoshoots should be fun and stress free, and when you choose to work with me, I will help you prepare for your session and make sure that I capture your family’s love with all of your personalities shining through in your images. Here are a few guidelines I’ve put together so you guys can be sure to look great while still making sure the images are focused on your family’s love, not what you’re wearing. I always suggest that the mom choose an outfit she feels confident and beautiful in. Then plan the color palette and everyone else's outfits from there. Keep your backdrop in mind when choosing your clothing. If you are near a field with grass in the background, aim to wear a color that doesn’t blend in the green/yellow grass. If you are surrounded by fall leaves, layering in great textures is a great option, and just about any color would look great. Most importantly, be sure to wear clothes you feel comfortable in. Your confidence will really shine through in your photos! I typically recommend people lean towards neutrals, earthy tones, and metallics and to stay away from bright colors. This doesn’t mean just creams and browns and grays. There are neutrals for every single color! Instead of green, go for a soft forest green. Instead of red, go with a deep maroon. Instead of yellow, go for a mustard yellow and so on. COMPLEMENTARY vs. MATCHING: Complimentary is good. Matching is bad. When people match, they tend to blend together too much, ending up looking like a big blob in photos. Complementary means the variety of colors, textures, accessories, patterns, and tones all go together while there is still separation from each of the subjects and the background. To help you get a better idea and visual of what different color combinations look like and how to plan what to wear for your family session, I’ve added a few photos from my previous client sessions who had the most perfect colors schemes! 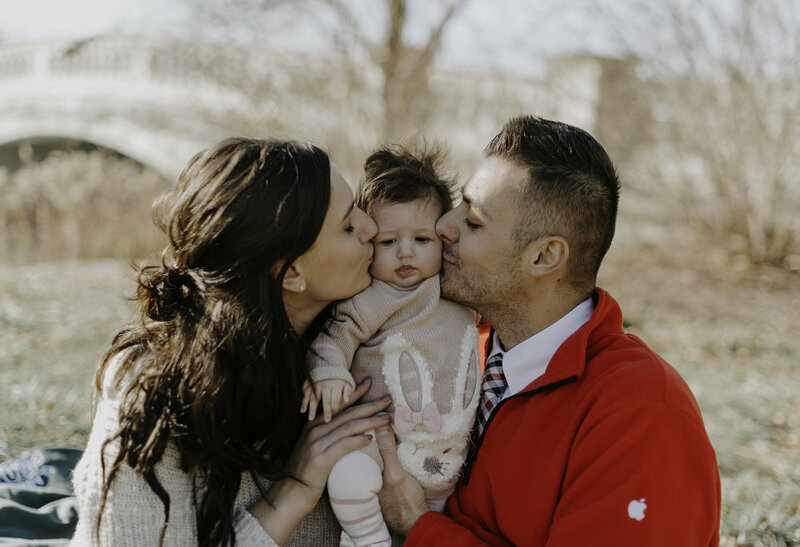 To help you prepare for your family session, I’ve put together a few outfits that you can directly shop below or use for inspiration to create your own combination. Find a color palette that you love and choose outfits that complement each other without looking too “matchy”. Everyone will have a unique look without clashing in the photo. You can choose to do neutrals with a few pops of color or a softer palette that has different ranges in tone of the same shades. If everyone wears the same color, they won’t really stand out in pictures as they will be blended in with each other. I would recommend the mom wear a shirt or dress that is one solid color, the dad wearing pants that are the same color as the mom’s top or dress or just black pants with a patterned shirt that has a little bit of the color of the top or dress the mom is wearing. And for the kids, you could dress them in the same color as the mom is wearing or a different color with shoes that are a matching color to the parent’s outfits. Avoid big, loud, chunky, crazy patterns. The smaller or more subtle, the better! If the pattern is too loud, it will distract from your faces. Flannels are always a yes in my book! I usually try to avoid pairing too many patterns together because it makes the photos feel a little hectic and distracting from your faces and the location. Also, be sure to iron your clothes before so there’s not huge wrinkles distracting from your faces either! If you have a fun patterned outfit you would like to use, limit it to one person. That way they will pop and still coordinate with everyone else. Multiple patterns can look busy, and this way they won't be competing with one another. Add dimension and interest by mixing up the texture of the clothing material and accents. Feel free to bring cute little accessories such as scarves, hats, belts and anything with a fabulous texture. Accessories can pull together an outfit and make it look complete. Plus, by switching up accessories and layers, you can get multiple looks without having to do complete outfit changes. I hope you found this blog post helpful with planning what to wear to your family session! Let me know in the comments below which color combination is your favorite from the examples in this post. I’d love to hear your thoughts! If you’d like more inspiration on family sessions and outfit ideas, check out my Pinterest boards here. Looking for a family photographer? I’d love to capture your family and give you images you will cherish forever. Reach out to me and we can chat more about what your needs are and if we’re a good fit. OV Photography is based in St. Louis, but travel anywhere is always welcome!